ODV Wissenschaftspreis 2016: Zusammenfassung der Gewinnerarbeit von DDr. Ulrike Kuchler et al. Buser, D., Janner, S.F., Wittneben, J.G., Bragger, U., Ramseier, C.A. & Salvi, G.E. (2012) 10-year survival and success rates of 511 titanium implants with a sandblasted and acid-etched surface: a retrospective study in 303 partially edentulous patients. Clinical Implant Dentistry and Related Research 14: 839-851. Degidi, M., Nardi, D. & Piattelli, A. (2012) 10-year follow-up of immediately loaded implants with TiUnite porous anodized surface. Clinical Implant Dentistry and Related Research 14: 828-838. Mertens, C., Steveling, H.G., Stucke, K., Pretzl, B. & Meyer-Baumer, A. (2012) Fixed implant-retained rehabilitation of the edentulous maxilla: 11-year results of a prospective study. Clinical Implant Dentistry and Related Research 14: 816-827. 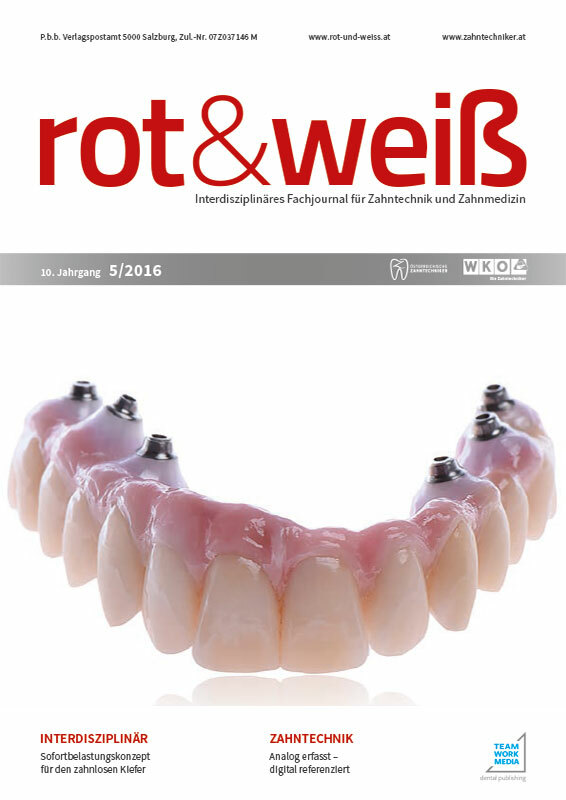 Fischer, K. & Stenberg, T. (2012) Prospective 10-year cohort study based on a randomized controlled trial (RCT) on implant-supported full-arch maxillary prostheses. Part 1: sandblasted and acid-etched implants and mucosal tissue. Clinical Implant Dentistry and Related Research 14: 808-815. Adell, R., Lekholm, U., Rockler, B. & Branemark, P.I. (1981) A 15-year study of osseointegrated implants in the treatment of the edentulous jaw. International Journal of Oral Surgery 10: 387-416. Schroeder, A., van der Zypen, E., Stich, H. & Sutter, F. (1981) The reactions of bone, connective tissue, and epithelium to endosteal implants with titanium-sprayed surface. Journal of Maxillofacial Surgery 9: 15-25. Papaspyridakos, P., Mokti, M., Chen, C.J., Benic, G.I., Gallucci, G.O. & Chronopoulos, V. (2014) Implant and prosthodontic survival rates with implant fixed complete dental prostheses in the edentulous mandible after at least 5 years: a systematic review. Clinical Implant Dentistry and Related Research 16: 705-717. Morton, D., Bornstein, M.M., Wittneben, J.G., Martin, W.C., Ruskin, J.D., Hart, C.N. & Buser, D. (2010) Early loading after 21 days of healing of nonsubmerged titanium implants with a chemically modified sandblasted and acid-etched surface: two-year results of a prospective two-center study. Clinical Implant Dentistry and Related Research 12: 9-17. Bornstein, M.M., Wittneben, J.G., Bragger, U. & Buser, D. (2010) Early loading at 21 days of non-submerged titanium implants with a chemically modified sandblasted and acid-etched surface: 3-year results of a prospective study in the posterior mandible. Journal of Periodontology 81: 809-818. Del Fabbro, M., Wallace, S.S., & Testori, T. (2013) Long-term implant survival in the grafted maxillary sinus: a systematic review. International Journal of Periodontics and Restorative Dentistry 33: 773-783. Checchi, L., Felice, P., Antonini, E.S., Cosci, F., Pellegrino, G. & Esposito, M. (2010) Crestal sinus lift for implant rehabilitation: a randomised clinical trial comparing the Cosci and the Summers techniques. A preliminary report on complications and patient preference. European journal of Oral Implantology 3: 221-232. Kahnberg, K.E., Wallstrom, M. & Rasmusson, L. (2011) Local sinus lift for single-tooth implant. I: clinical and radiographic follow-up. Clinical Implant Dentistry and Related Research 13: 231-237. Rasmusson, L., Thor, A. & Sennerby, L. (2012) Stability evaluation of implants integrated in grafted and nongrafted maxillary bone: a clinical study from implant placement to abutment connection. Clinical Implant Dentistry and Related Research 14: 61-66. Sennerby, L. & Meredith, N. (2008) Implant stability measurements using resonance frequency analysis: biological and biomechanical aspects and clinical implications. Periodontology 2000 47: 51-66. Valderrama, P., Oates, T.W., Jones, A.A., Simpson, J., Schoolfield, J.D. & Cochran, D.L. (2007) Evaluation of two different resonance frequency devices to detect implant stability: A clinical trial. Journal of Periodontology 78:262-272. Fischer, K., Backstrom, M. & Sennerby, L. (2009) Immediate and early loading of oxidized tapered implants in the partially edentulous maxilla: a 1-year prospective clinical, radiographic, and resonance frequency analysis study. Clinical Implant Dentistry and Related Research 11: 69-80. Sim, CP. & Lang, NP. (2010) Factors influencing resonance frequency analysis assessed by Osstell mentor during implant tissue integration: I. Instrument positioning, bone structure, implant length. Clinical Oral Implants Research 21: 598-604. Simunek, A., Kopecka, D., Brazda, T., Strnad, I., Capek, L. & Slezak, R. (2012) Development of implant stability during early healing of immediately loaded implants. International Journal of Oral and Maxillofacial Implants 27: 619-627.